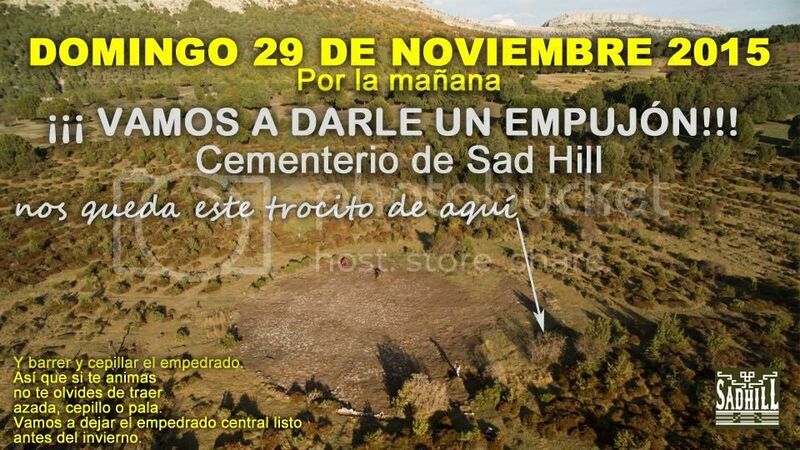 The cultural association of Sad Hill, established in Salas de los Infantes - Burgos, Spain; basically by a group of admirers of the film “The good, the bad and the ugly”, has begun some time ago to work in recover the famous cemetery, that was built for the film in the Valley of Mirandilla, municipality of Santo Domingo de Silos. It is expected to look like it was exactly 50 years after the date they are going to celebrate that anniversary (2016). Among the curiosities there is an initiative to sponsor a tomb (for those who live far away) to finance spending that requires removal of grasses, trees and improving the graves and the possible placement of crosses and tombstones. In the picture you can see how is going the recovery of the central stony circle. It is also a call to enthusiasts to get together to work this weekend. You guys should figure out how to actually be able to legally spread the ashes of folks who'd want to have their ashes spread there, that would be cool and you cold make some money for the project too. I have not contacted with anybody of that Association. Sometimes I´ve been in touch with Diego Montero, a guy who belong to the Collective Paleontology of Salas de los Infantes and one the most enthusiastic about everything related to the film and its location in the area. Is that where you want to be buried? Along with a fly fishing rod? I though it may fund projects, no? There is a great website called "Sergio Leone - Places of Memory" this guy Regis Cluseau has evey location mapped out. Unfortunately, time I checked the site was hacked so i have not gone back on in a few years; if you are brave you can check again and see if it's working ok. Regis used to post around here but not in a while. do the trains stop ?! Just returned yesterday from a trip to Madrid and the GBU sites near contreras. It was really great to visit Sad Hill again, especially after all the restauration efforts. I even managed to find my cross from the crowdfunding initiave! There was noone else around, so it was great taking pictures. It was also neat to find information on placcards near all the sites (also in hoyo de manzanares).